Tonight I was on my own for the care and feeding of Wombats. Jen was having dinner with Bill Pullman. When Jen is hobnobbing with celebrities it's only natural that I fend for myself. Thankfully the worst of this round of teething seems to be behind us. The guys were in much better spirits today when I picked them up and they had dinner and went to sleep with relatively little fuss. Of course, like any evening, there is always that moment when I think to myself, "Oh no, this is the night they just aren't going to go to sleep. It's finally happened." However, I have a few more tricks up my sleeve when it comes to tricking those little monsters into falling asleep. The guys were a little weird so I decided to show them how to eat their toast strips by taking bites myself. For some reason that made Elliott grin in a way I've never really seen him grin before. 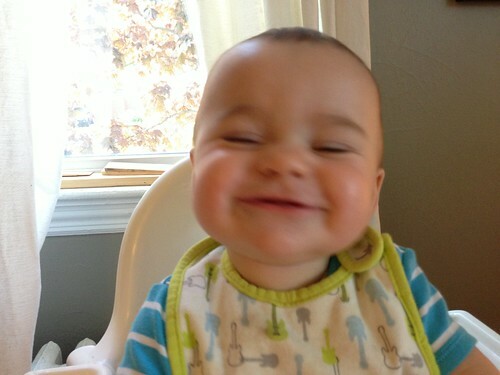 He was delighted in his father's genius at taking tiny bites of his toast. Sometimes they're a pretty great audience. Martin did what he normally does which is to just leave a bunch of food in his mouth for most of dinner and not swallow it. As I tried to mime the action of swallowing his food for him he decided he would just wave his head around like a little lunatic. 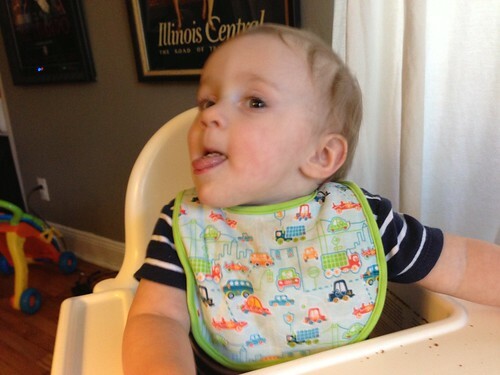 It must be pretty nice being a baby and getting to act like an ill-trained monkey at all times. 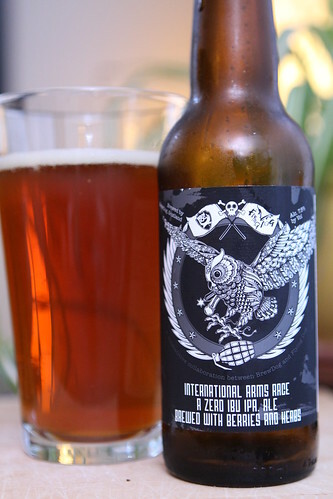 A while back I got a much anticipated beer, the Internatinal Arms Race from Flying Dog Brewery. It was an experiment in brewing and IPA with no hops. I was excited to try it because it seemed like a noble experiment. Ultimately it left me flat. 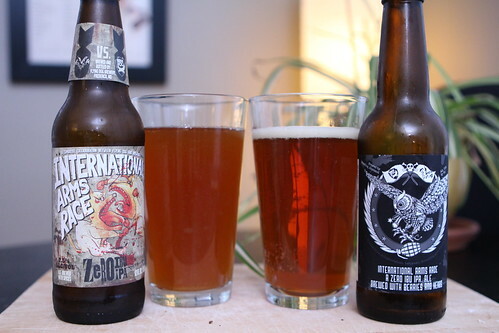 This beer was a contest between Flying Dog and its transatlantic colleagues over at Brew Dog. Who could brew the better zero IBU IPA. I found this one months later so I was able to try them out together for the first time as I enjoyed my leftover couscous. The Brew Dog version was surprisingly similar to the Flying Dog one. Both had an odd slickness to them, a viscous mouthfeel that was unexpected and unusual. Like the Flying Dog version I admired the experiment. In the end I think Brew Dog's version was slightly better but at the end of the day I think both breweries worked together to prove the same thing with this experiment. After trying these I felt I needed to have a different beer so I opened this Thirteenth Hour from Sam Adams. I got this one a while back and have been waiting to open the bottle for a while. It wasn't like I expected. It had very little in the way of chocolate and coffee and a lot of fruit and berry flavors to it. It was much more tart and sour than I would have expected. The conclusion from tonight is that the Wombats were happy, the beer was not hoppy, and Jen was hobnobby. That's the Reader's Digest Version.